Believe it or not, there's a scenario in which UCLA, already ineligible for the postseason, clinches the Pac-12's Rose Bowl berth. But, really, Jon Wilner's picking the Huskies until he sees Mike Leach actually beat Chris Petersen. In our ongoing attempt to cover every permutation for the division races — we’ve touched on the North and taken a deep dive into the South already this week — let us address an event that is neither likely nor incomprehensible. I can get UCLA into the Rose Bowl in four steps. That’s right. UCLA, the team that has seven losses and is ineligible for the postseason, could still make the Rose Bowl. 1. The Bruins defeat Arizona State, USC and Stanford to finish 5-4. They are underdogs this week in Tempe, will assuredly be dogs against the Trojans and could be in the finale, too. But the line is thin. Because each opponent has proven vulnerable, it wouldn’t take much uptick in performance for the Bruins to win any of the three. Or all three. 2. Colorado loses to Washington State or at Cal to finish no better than 4-5. 3. Utah, which is without starting quarterback Tyler Huntley (broken collarbone), loses to Oregon and Colorado to finish 4-5. 4. Arizona loses at Washington State to finish no better than 5-4. The most unlikely step, by far, is the first one. But if results unfold in that fashion, the Bruins would be 5-4 and own head-to-head victories over any other teams that could finish 5-4 (Arizona, ASU and USC). They would win the South with a 5-7 overall record and face the North champ in the title game. At that point, why bet against them? And if you’re wondering, there is no rule that would prevent them from playing in the Rose Bowl with a losing record. The Pac-12 champ is the Pac-12 champ. Any other season, the Hotline wouldn’t bother raising the possibility of a 2-7 team climbing into the Rose Bowl. But after the intra-conference carnage we’ve witnessed, nothing should be dismissed. The Hotline’s preseason pick to win the conference remains the late-season pick to win the conference and enjoy the Granddaddy for the first time in 18 years. Impressive as Washington State has been (holding steady at No. 8 in the CFP rankings), I can’t project the Cougars to beat Chris Petersen until I actually see them beat Chris Petersen. 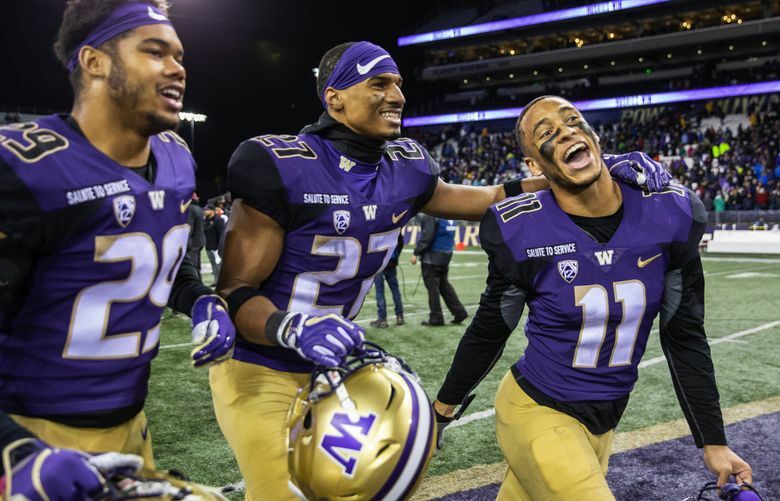 The Hotline’s projected South champs — the defense and running game will lead the way — will be no match for Washington in the title game. Redbox would have its pick of available teams with no more than a one-game difference in conference record. (It could jump a 6-3 option in favor of 5-4, in other words.) Why not showcase the potential No. 1 pick in the draft. While devoid of division significance, the finale against the Irish could be one of the most important games of the Pac-12 season, with a victory potentially clearing the playoff path for Washington State. Add the weaknesses to the mounting injuries and upcoming locations, and it’s not difficult to envision the Cardinal losing to Cal for the first time in nine years and to UCLA for the first time in 10 … and doing so in back-to-back weeks. Hotline modeling (i.e., the last thought to pass through my cranium before typing) has the Wildcats winning the Territorial Cup, thus serving two purposes: Propelling them into the postseason, and ensuring a better conference record than ASU. Expecting one more win from the Devils — probably this week — but because of the selection procedure, ASU would be squeezed out of conference-affiliated bowls by teams with 5-4 (or better) records. Defense is good enough for the Bears to win all three; offense is bad enough for them to lose all three. Our lean is one victory: Either the Bears get bowl-eligible and then have a letdown in the final week(s), or they rise to the moment in a must-win against Colorado. Only a season-ending seven-game losing streak would keep CU out of the postseason, and one could argue that such a tailspin is the mark of a team that doesn’t deserve to make the postseason. November isn’t quite as brutal as expected. We’ll upgrade it to merely extremely challenging. I’d like the Bruins’ prospects to sweep their final three a bit more if they weren’t visiting ASU on the back end of consecutive road games.